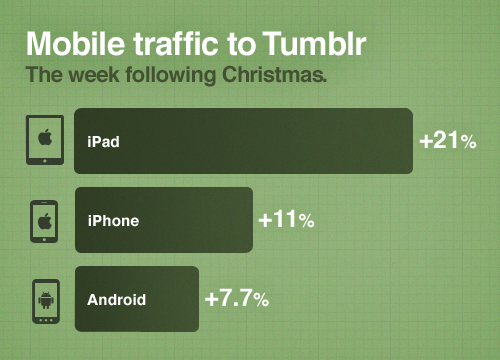 The popular blogging platform Tumblr saw a 21% jump in iPad traffic, an 11% jump in iPhone traffic and a 7.7% upward tick in Android traffic in the week following Christmas. The Christmas season saw a jump in all kinds of metrics related to mobile devices. Google said that it saw 3.7M Android device activations over the holiday. There was also reportedly a 12x jump in iPhone activations over the holidays.